The AVC is having their annual New Year’s campout. This is a safe place to bring in the new year. This year we are going back to Wickenburg. 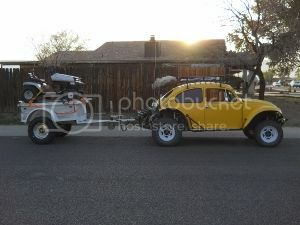 Wickenburg is close enough to town and far enough away for some good off-roading and fun. Those of you that are new to this event, we find a safe place to camp and enjoy Arizona’s beauty and serenity. We usually have a group campfire that everybody enjoys the warm conversations. For the day runners, they usually show up around 9 a.m. and go riding for the day. This year we are planning on a large event, due to the 1st being on a Tuesday and most of us will be getting Monday off, making this a 4-day event. Dawn and I plan to secure camp earlier that week. I need to know who is going to bring a motorhome so that I can make sure that we will have space for you when you get there. We want everybody to be able to camp together. The folks in the tents can camp anywhere. Also this is a good event to bring your non-street legal rides. Feel free to bring your non-VW off-road toys to play with. Just make sure if you bring heavy metal that you bring a friend that is able to pull you out if you have trouble. Our little buggies just aren’t strong enough to rescue a full-sized heavy vehicle. Kenny and I went to scope out some campsites last weekend and we found some nice ones…! The problem, as always, is that everyone else is doing the same thing. What makes it worse, is that it is a 4 day holiday weekend, combined with the beauty of Wickenburg and its tolerance of long-term campers , A campsite may be hard to find. So what I am going to do is leave Thursday and secure camp, login and post where the campsite is. This campout has always been a blast. Come out and enjoy. To find me just go to Google them to "Maps" then just put in this number... "33.912064,-112.81186"
Look for my Yellow baja.. This year’s New Year’s party was a complete success I just want to say thank you to all the people that came out despite the weather reports, those who did enjoyed beautiful days of 70° weather and trails that are absolutely to die for. We explored a new area of Wickenburg by the Vulture mine, Kenny and I recon the bunch of loops out there earlier this year to make sure that all vehicles that attended this event could traverse them easily over this holiday weekend, not to say that Wickenburg can’t offer the rock crawlers a challenge or two we just try to avoid those areas with the larger events. On the last day of this AVC event Chris found a loop road with some stellar five star washes to drive in that I have added to my GPS collection of trails for this area a matter of fact we explored many new trails and found new loops which we will be adding to next year’s event, hopefully most of us won’t wait until next year to get back out to Wickenburg to do some trail riding this particular area is not only beautiful but remote and has not been torn up by the bad off roaders. I have been known to hop in the car and end up in the Wickenburg area for short little day run every now and then. We had a great time! Awesome country out there and the trails were a blast. Looking forward to the next one. Sorry I missed it, and yea I was one of those looking at what the Temp was supposed to be and wussed out. LOL Really I had too much going on to make it anyway. Glad it was a success and hope to make next years run! I saw Noahs go-pro videos. Hard to believe from the videos it was pouring rain the night before. Indian - build a small fire everybody sit close. white man - build a big fire everybody sit back. went another 50 miles on my rail this weekend and the valve clearance didn't change!I.m good to go, oh ya Dalton wasn't joking about our fires they'll keep you warm. There are soo many trails to explore out there, every year the AVC goes to a different spot and end up finding all kinds of cool and neat things, I'm sure this year will be no differant! see everybody out there! AzBaja Fire So BIG, people too scared to light it.